Everything which you love will come packed in the new Apple iPad and thus; it will be much entertaining for the users all over the world. It has been long time since we are listening to various rumors and speculations on the internet. But this time, Apple has launched the new iPad with great specifications and features that will be in your palm. Though it seems to be focusing on the gaming and entertainment yet the new iPad will have numerous merits for the business purpose. Yes, this new gadget has got some improved video capabilities and graphics design that will be perfect for the media channel. Moreover, a little eye strain will be there to the users because it will be much easier to read. Creation of new contents will be also simple. Healthcare industries might also benefit due to higher resolution pixels and better graphics. Business will also look for the improved dictation capabilities of the new iPad. This is none other than Apple which can leave some space for its competitors. In the design segment, the new iPad has got nothing fresh from the previous year’s model. You might be concerned about the thickness which has gone to 0.37 inches and weighing around 1.44 pounds. So, it is slightly heavier. But all the other specs of the iPad are quite similar to the iPad 2. Aluminum construction, glass, similar home button and bottom edge are just copies of the past model. Even the dimensions remain the same with 7.31 inches of width and 9.5 inches of height. 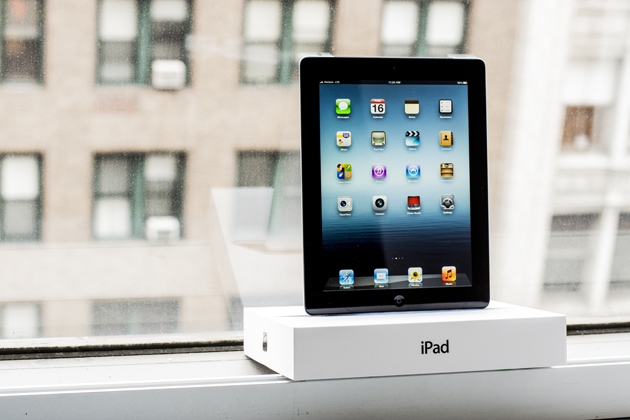 · The new iPad will boast of having the fastest A5X process with dual-core CPU and quad-core graphics. It will definitely boost the graphics and gaming world. · Another welcome feature to this iPad is the addition of dictation feature. It will simply help the iPad owners to compose quick mails and searching new contents on the internet. · The iSight camera, the rear side camera of the Apple new iPad has been greatly updated to 5 megapixels. The quality of the photo shots is just more than excellent but the contribution of the screen cannot be avoided. · You will be further amazed at the screen resolution which the iPad will offer you in your palm. This is about the staggering 2048 into 1536 pixels of resolution which is unmatched against your laptop, HDTV, tablets or even desktop computer. · All three released models will be connected to the internet through Wi-Fi. You can benefit from 3G cellular or 4G connection by taking monthly plans of AT&T and Verizon. · Retina display will further enrich your experience. Summary: – With an amazing new screen and improve resolution, the new iPad will bring new dimension to your entertainment world. It has got the latest A5X processor with great graphics and gaming options. The rear camera has been upgraded to 5 MP.